I promise I'll move in with time from this lockstitching mania, but I've busy and it's a very easy way to whip up something fast without having to pay (too) much attention to what I"m doing. 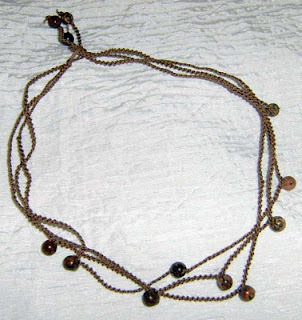 Here's a simple three strand lockstitch necklace using size 20 cotton thread.As I mentioned before I usually try to avoid metal findings when possible, so I being with a loop and finish with a button. Click on a pic for more detail! I've been thinking about chains lately. The fiber made kind, that is, of course. I guess it really started waaaay back when... well...not all THAT waaay back when.... hmmm, oh well... as a child of about eight or so my mother starting me out on crochet and I can still remember the G hook and the light blue yarn I used for that chain. 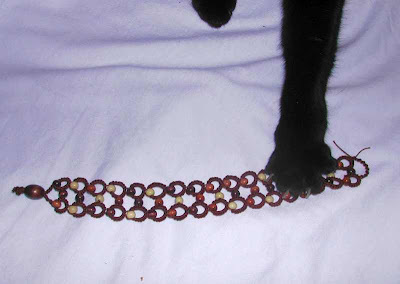 I wound what must have been at least twenty feet of crocheted chain into a ball... I was very proud! Although I've created many other things through the years and incorporated various fancy stitches, I marvel most at what can be done with the simplest of elements and the most basic of stitches. This is probably why I've always loved tapestry crochet too... one simple stitch... and the design and color used bring it to life. But I digress.. or do I? 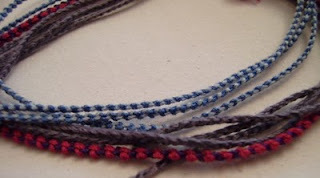 A few years back I even crocheted up a bunch of brightly colored chains and sold quite a few at local craft sale as a kind of versatile jewelry you could wind into a bracelet or necklace. Lately, I've been feeling not too inspired and have mainly focused on getting out those WIPs (works in progress) that I've had laying about and getting them finished up - and I've been pretty successful with that - yay!. 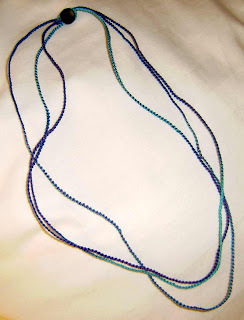 Then a series of things got me back to thinking of the wonders of the chain again... this time, the tatted chain. 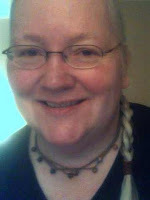 I created a series of tatted necklaces around the holiday time and what people commented on most was the way I had tatted the chain ... with a lockstitch (first part flipped, second part not flipped). 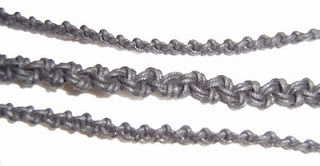 It gives the chain a very woven, macrame kind of look (another example). People sometimes ask for instructions.... and I have to say, I rarely write down what I do, but here's an attempt at this simple little bracelet. If you don't know lockstitch at all, you might want to start with the instructions in the links up above there. 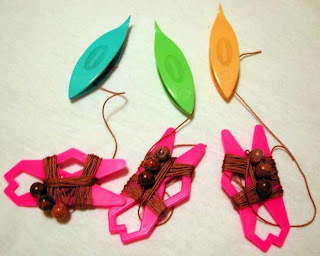 Although I did needle tatting years ago, I left it by the wayside once I learned to shuttle tat, so I admit my ignorance of needle tatting mechanics and my bias for the shuttle. 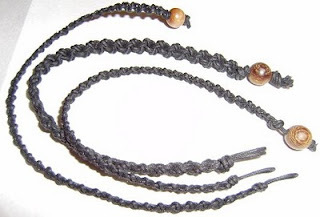 when you've reached the desired length, finish with another overhand knot, slip on the bead, do another overhand knot (or two) to secure the bead .... woohoo... you got your bracelet! Just a couple pics of a necklace prototype. 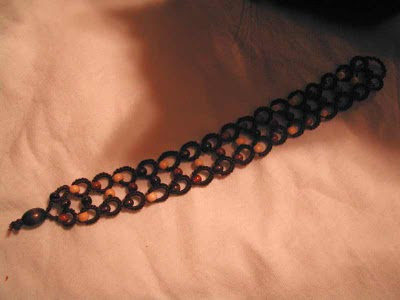 It's tatted with size 10 Lizbeth thread with nine leopard skin jasper beads added... oh, 12 if you count the closing beads. 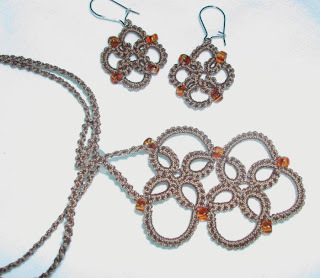 I did this with three strands of tatting..... so I had to start with three shuttles and bobbins. I felt they were picture-worthy! I did a simple over hand knot making a loop jut big enough to slip something through for the closing. I tend to dislike metal findings so I don't use them if I can find another way. (I think it's due to the fact that my skin is sensitive and breaks out easily with most metals... silver is ok, but the tarnish factor is a nuisance and gold does not bother me, but it's just too expensive to use for most things, especially if I need to pass that cost onto a buyer). 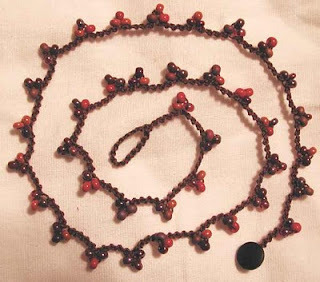 And here's pic of this necklace on the official Crunchy Banana website model (ok, ok, yeah... I gotta find someone else to model my stuff... or maybe get a manequin of some kind... either way they'd do more justice to it than I!!). Some years ago I happened onto a rummage sale at a youth center. My husband had been volunteering there, and they were having the sale to raise funds. Now, far be it from me to pass up a rummage sale, you never know what you might find, but I never go into a sale like that with many expectations. It's much more satisfying to come out feeling very excited with a unexpected treasured purchased at a great price! So I scanned the various knick knacks and such and found my way over to the piles of books. I noticed a book about crochet, and figured I'd start there, with the crafty looking books. They were standing on a table, leaning against the wall behind. As I started flipping through them, I noticed that behind the bigger books, closer to the wall, were some smaller pamphlet type books and a plastic bag with a couple balls of crochet thread and some tools in it. I had only recently started tatting, and I suddenly realized I had hit a jackpot. Well, a jackpot for me, anyway. 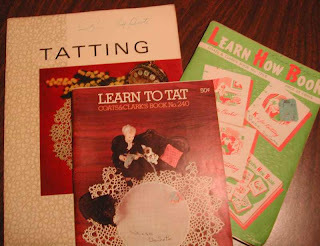 There, beneath the plastic bag of goodies, were three older books , two of them dedicated completely to tatting, and the other a smaller version of a needlework how-to book that I can remember my mother having when I was a child. Each of the books had written on it in the name of the original owner, Rose DeSoto, and although I'll never really know for sure, I've always felt that bag of goodies, which consisted of a couple balls of crochet cotton, a couple tatting shuttles, various crochet hooks and a few other odds and ends that I can no longer remember, belonged to her too. I don't know who Rose was. I've no idea the kind of person she was or how she lived her life. I don't know how these things of hers ended up at the sale. Of course it's fun to imagine.... Did she get tired of tatting and figure... out of sight, out of mind? Or, more likely, did she pass away and these things, not of interest to anyone else, put in a donation box in hopes of finding a new home? Everytime I pick up one of these books to see if they might spawn some new idea for me I think of Rose. Then I think of who might pick up one of my books one day, one of my shuttles, one of my crochet hooks. Will they look over all the shades of orange thread I seem to collect and wonder what I was going to do with them? Will they wonder who the heck I was? I hope they don't tat up a bunch of orange doilies! A favorite pastime for many of us fiberholics ( I use the word many cause I hate to think that I'm alone here!) is collecting usable bags/containers/gadgets to store and carry our craft and crafting tools around with us ... it's a big part of the fiber addiction! I must admit that a certain percentage (not as yet determined mathematically) of my fiber studio space is taken up by various kinds of bags and such. 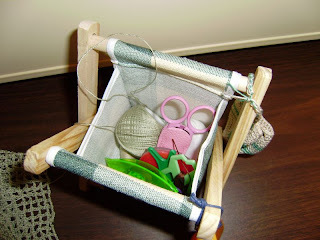 The little cloth covered, wooden framed, foldable thing looks like what my grandmother used to use when she crocheted. This one, however is much smaller. It's only about 5.5" in height, with a width of about 4.5" x 3.5". I can't remember exactly where I bought it. I think it was in a "dollar store" when I was living in Spain. It's just big enough that I can fit the filet scarf into it, fold it (somewhat anyway) and slip it into my work bag for my commute to work. I like that it sits on a table and is just big enough to hold the few things I often need at hand, in this case: a ball of thread for the little filet crochet scrarf I'm working on, a couple tatting shuttles, assorted needles, scissors, bobbins, tape measure and (if you notice the little bag hanging off the side) smaller things like a couple needle threaders (I'm good at breaking them! ), stitch makers, paper clip, and a button or two. I'll save mention of my handbag collection (blush - yeah, like you couldn't guess) and my collection of little bottles for beads (woohoo for hotel condiments served up in those little glass bottles) for another post! And... just to set the record straight... I own fewer than ten pairs of shoes!! A simple little necklace I tatted up tonight. 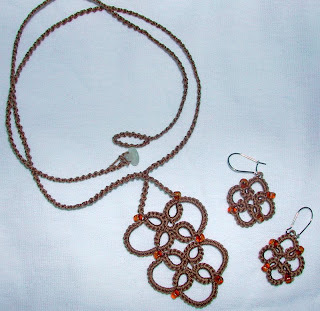 I used size 10 cotton thread in brown with glass beads in red, mustard, and shades of brown. 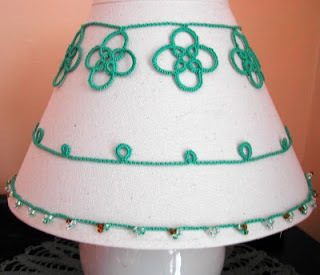 I decided to spruce up this little lampshade with a bit of tatting and here is the result! I had a bit of leftover size10 cotton thread (Cebelia, teal) left on a spool that I had used for something years ago (now, as an aside... 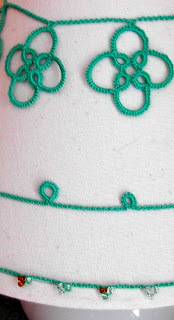 I don't tat with size 10 thread often and not at all with Cebelia, but none the less, here you have it - not that I have anything against Cebelia, but I like it more for crocheting than tatting). Where was I? Oh, yes... I had pulled it out to use for experimentation and then got this idea. We've had this little lamp for years and it sits right next to where I often do my work and well, it called to me. For one of those off the cuff kind of designs (which is my specialty since I'm not much of a planner when it comes to fiber designing) I was pretty pleased with the result. This makes for one easy project and the possibilities are endless. 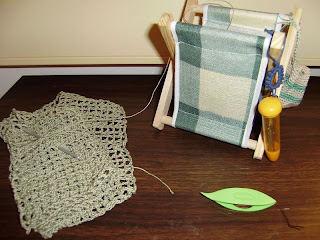 On a practical note, since the tatting is not sewn or glued on to the shade it can easily be removed for cleaning or for putting somewhere else.